INTRODUCTION: Top-down influences direct visual attention, and common neural mechanisms decide the items that are held in visual short-term memory, which is in turn a crucial driver of behaviour. Cognitive functions are seen as depending on information being retained in the brain after the original signal input is no longer present. Visual short-term memory allows retained visual information to guide behaviour. Top-down influences are argued to give preference to inputs that are more likely to be relevant to such behaviour. In an experiment, in which subjects were conscious of having seen more letters than they could accurately report, a prompt to memorise certain types of letter had the result that they remembered those letters, but forgot the rest. This was taken to indicate the ability of other parts of the brain to steer the memory process. The short-term memory is associated with the dorsolateral prefrontal cortex, and this area is seen to be essential for retaining information over short periods of time. Some neurons responding to visual signals have enhanced activity throughout the period that the information is held in short-term memory. Moreover, this activity is able to resist distracters. There appears to be some specialisation according to the type of signal, with the frontal eye field (FEF) encoding spatial coordinates. However, this appears to be less the case within the dorsolateral prefrontal. The visual short-term memory also appears to be related to activity in the parietal cortex, and activity here is suggested to scale in relation to the number of visual items that are being maintained. The encoding of the visual short-term memory is additionally apparent in the inferior temporal cortex, part of the higher-visual cortex. However, activity here is more vulnerable to distracters than is the case with prefrontal activity. There is thus a contrast between the temporal and frontal cortices, with frontal activity appearing necessary to prevent distraction. Brain oscillations have also been seen to correlate to the increased short-term memory load; there is an increase in high-frequency gamma activity, and the short-term memory also appears to be phase-locked to theta oscillations. This is suggested to facilitate communication across a distributed cortical network. The process of retaining a visual memory is suggested to involve a subset of the neurons that encoded the original signal. The mechanism of attention that influences the original perception is also suggested to direct the visual short-term memory. Sometimes there is a competition between visual stimuli, in which case there is a winner-takes-all situation in favour of the most active neurons. There is evidence of capacity limitation in the short-term memory with room for only a limited amount of visual information. The number of items is relevant. Change detection for colour or shape declines when there are more than four items in the visual memory. If more features are stored in one visual area, for instance colour, this reduces the capacity available for other memory storage. The limited capacity of the visual short-term memory means that access to it is selective, and driven by existing bias. Preparatory attention is associated with top-down signal from frontal and parietal areas and is biased towards signals that are relevant for behaviour, which in turn are more likely to come into the visual short-term memory. In the primary and secondary visual cortex top-down influences preactivate retinoscopically specific areas of the visual cortex. On occasion, such areas are activated when no relevant signal subsequently appears. Attention is here seen as influencing the subset of perceptions that will come into the visual short-term memory. Attention may continue to be biased in favour of items already in the short-term memory. Brain areas important in this processing included the precuneus, the superior parietal lobule, the intraparietal sulcus and the frontal eye field. Spatial orienting in the perceptual system and the visual short-term memory are suggested to share common neural structures; thus attention, perception and visual short-term memory are suggested to use a common mechanism. 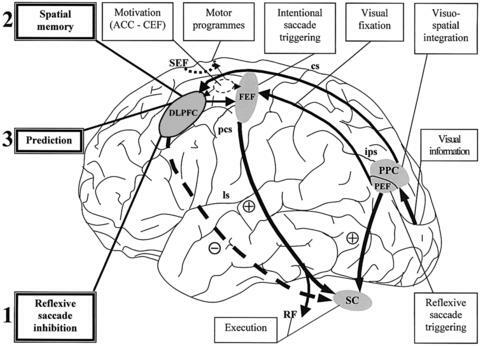 The short-term memory may be based on persistent activation of the underlying perceptions. Perception and visual short-term memory look to share the same bias in favour of behaviour relevant inputs. Bias also looks to determine which items will be retained longer in short-term memory. There is a distinction between lengthy and robust retention of up to four items, and the ability to hold more items but with a greater risk of decay. Stability of representation in both the dorsolateral prefrontal and the parietal is argued to depend on a considerable degree of protection from the bombardment of information found in the lower sensory cortex. Task goals are seen as an important item in how information is encoded in the visual short-term memory, which is viewed as dynamically changing in relation to behaviour, rather than being a fixed picture that gradually fades.